I just posted the Hallelujah Home Tour a few weeks back. Is it too soon for another one? Maybe. 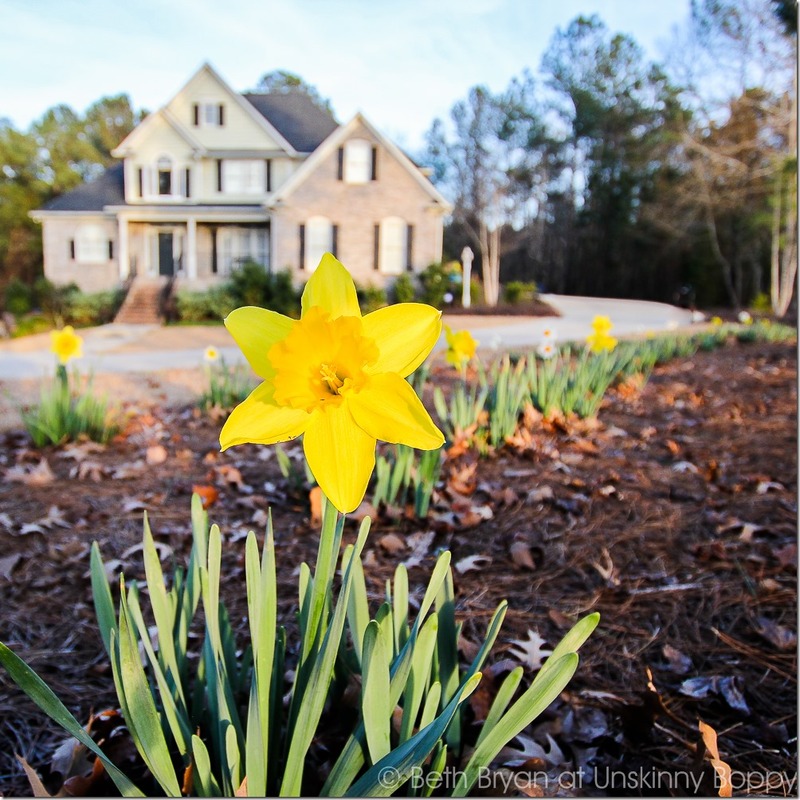 But my daffodils are in full bloom, and they have taken over my house right now, so I might as well show them off, right? 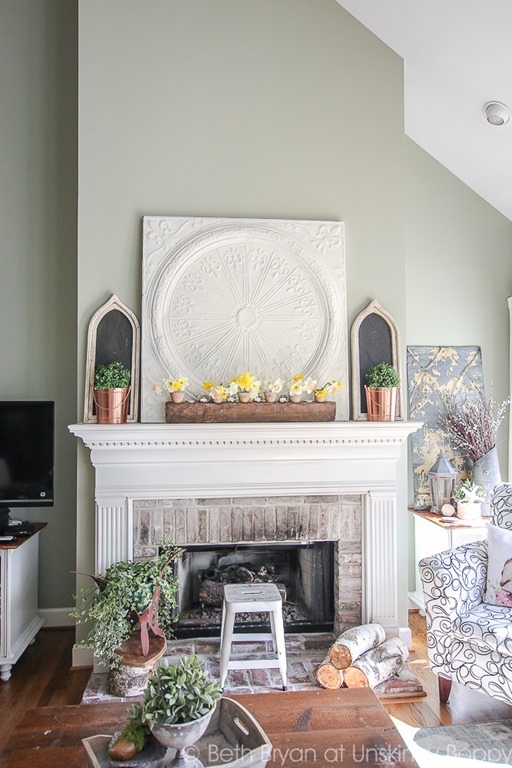 I also couldn’t resist joining some of my very favorite bloggers for this Cozy Spring Home Tour today, hosted by my friend Rachel at Shades of Blue Interiors. 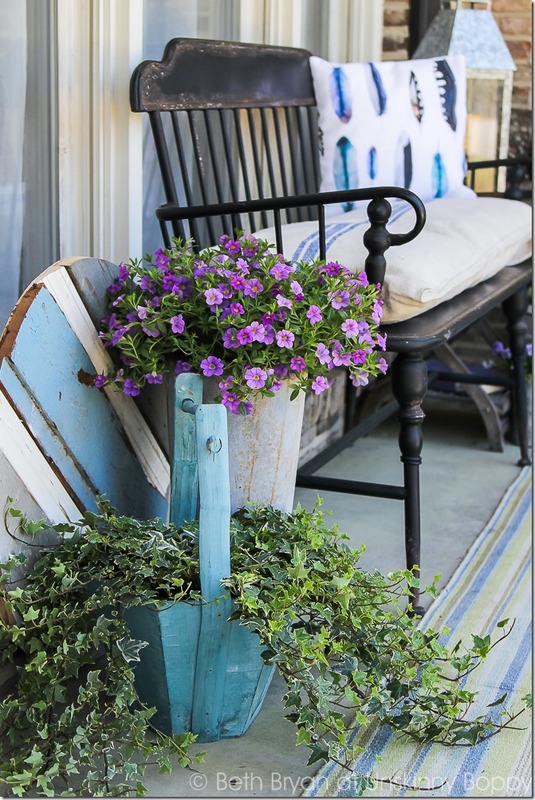 As a gardener, Springtime is one of my favorite times of year. And this year I have a whole new yard to fill up with flowers. Let’s start outside in my front yard, where my daffodils are blooming their little heads off! Well now they are growing long and strong and YUUUUUGE. 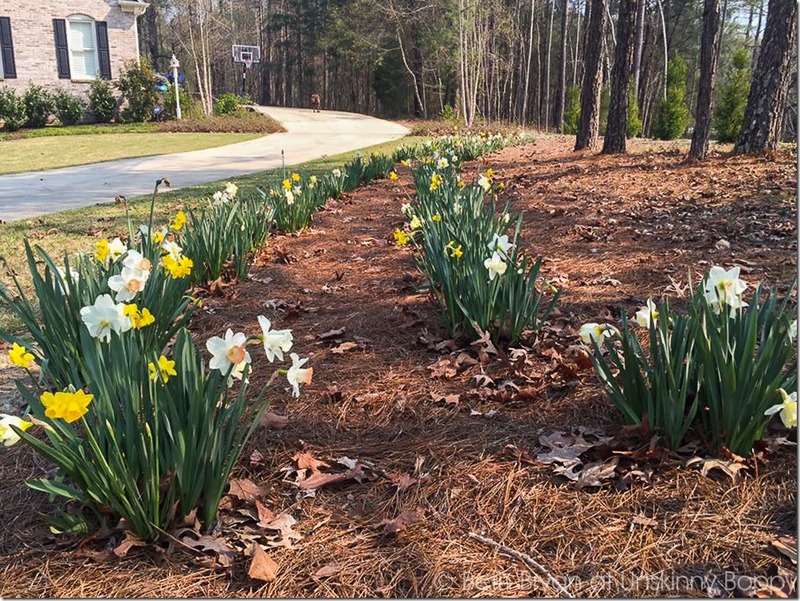 I have never seen such giant daffs! 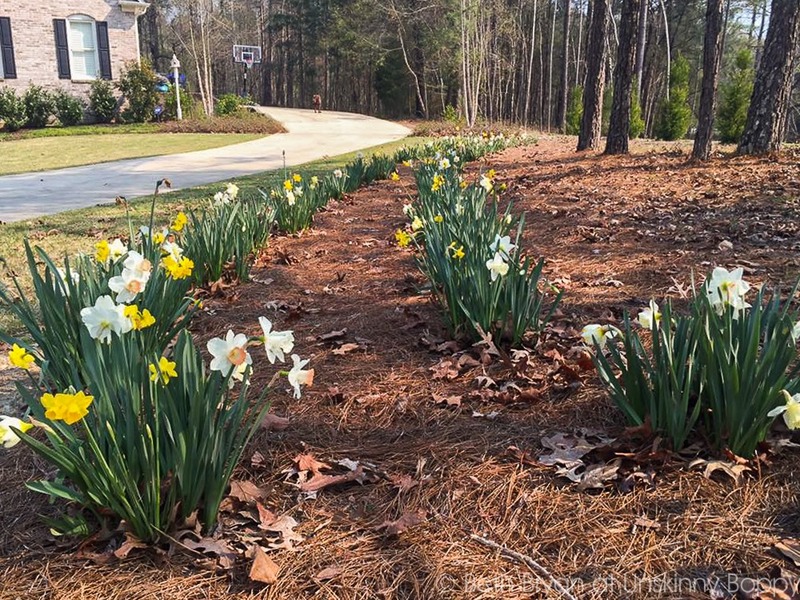 I planted a big mixture of a bunch of different kinds of bulbs (read all about it in this post) and they seem to be blooming in waves. The first wave was mostly yellow, but now (about a week later) the second wave has lots of whites and cream colored blooms. 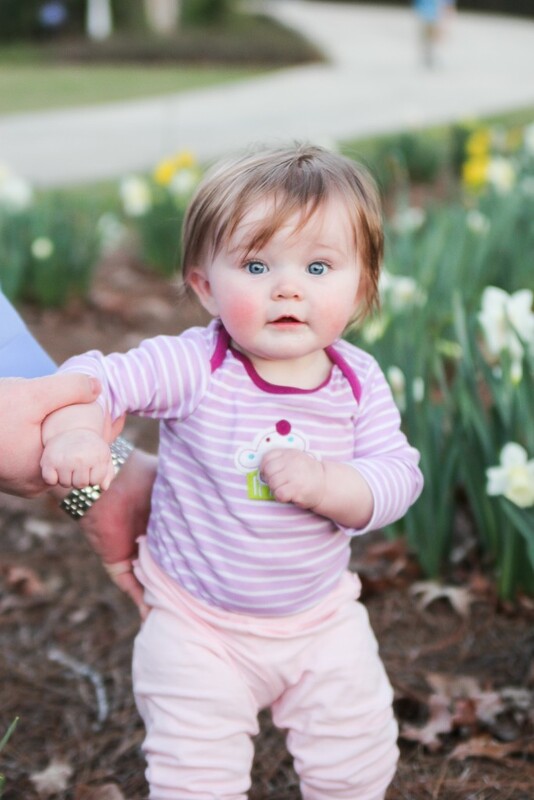 Caroline got to do a little tip-toeing through the tulips for this photo shoot. It’s pretty impossible to get ALL of them in one shot, so here’s a panorama from my iPhone to give you an idea of how many there are! 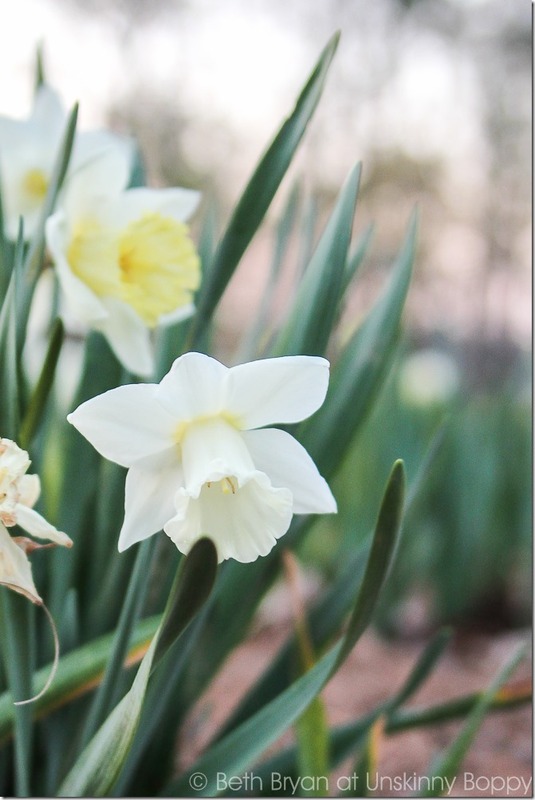 It makes me SO SO HAPPY to arrive home and see these pretty daffs blooming. 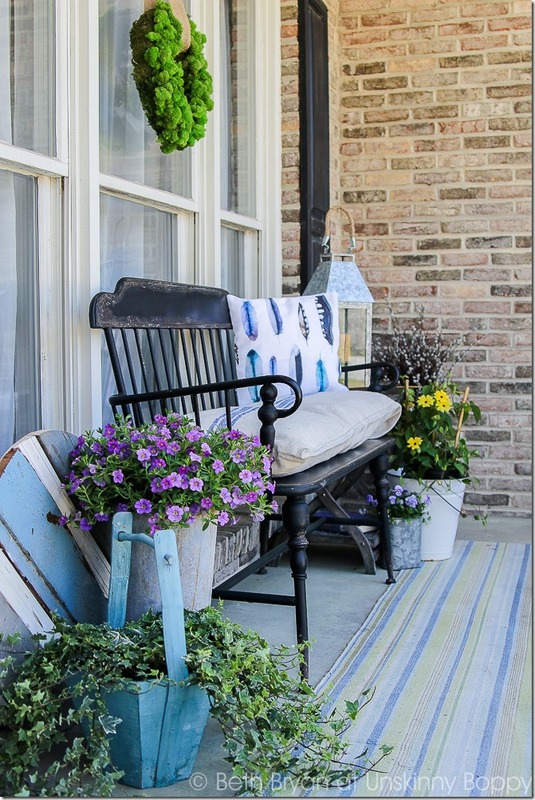 Up on the front porch, my new bench is perfection in this space. Earlier this month I posted this picture on facebook asking if this bench was a yay or a nay, and it got a resounding YAY from you guys (566 likes! WHAT?). So, I loaded it into the back of my SUV in the pouring rain and brought it to it’s happy new home on my porch. I have searched all year for the perfect front porch bench, and I’m so happy to find this one. Doesn’t it remind you of Colonial Williamsburg or something you’d see in Amish country? I just love it! Turns out this is not an antique bench, but a reproduction from the Park Hill Collection. Coulda fooled me. I don’t care, though. It’s perfect! It’s made of metal, and it’s lightweight even though it’s super sturdy. I put two regular sized pillows inside of my big french grain sack for a seat, and added this pretty blue watercolor feather pillow created by my beautiful friend Lucy at Craftberry Bush. Her pillows make me SO happy, and this one is extra special. When I met Lucy for the first time at Haven Conference, she gave me a slip of paper with one of her gorgeous watercolor feathers painted on the front and a sweet note on the back. So every time I see this pillow it reminds me of our fun time in Atlanta together. I have been on a plant buying spree even though it’s still getting down in the 30s and 40s here at night. I believe most of the danger of frost has passed here in central Alabama, though. At least I hope. Let’s head inside now and check out the house. 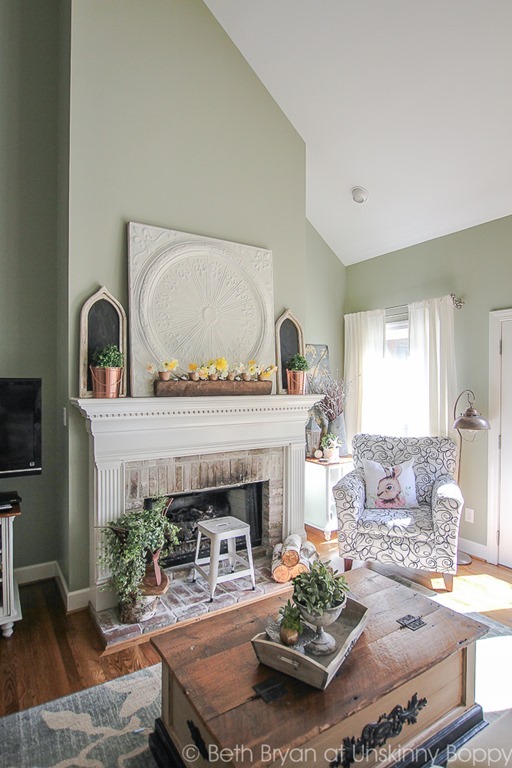 But, I did make a few minor changes in the living room. I just realized that I have not yet shown y’all my brand spankin new sofa! 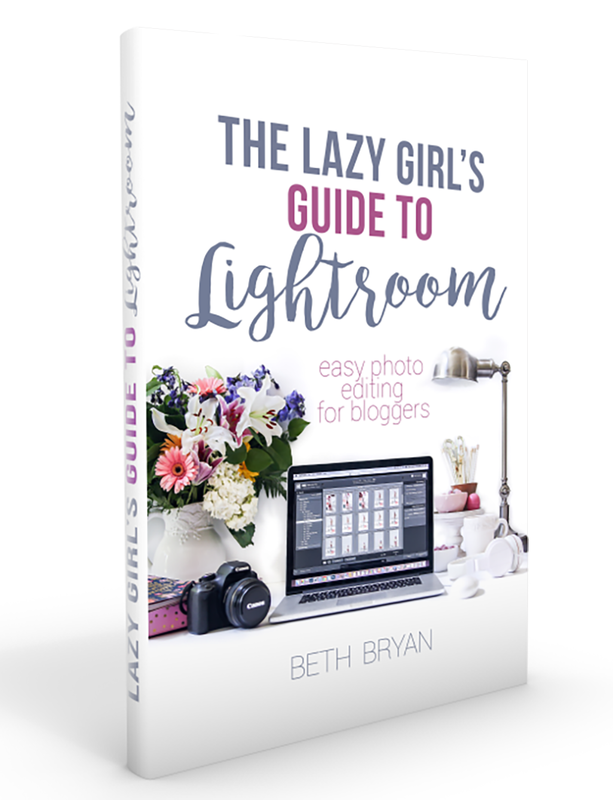 It delivered a few months ago, and I’ve been too busy lounging around on it’s big marshmallow-y goodness to remember to blog about it. 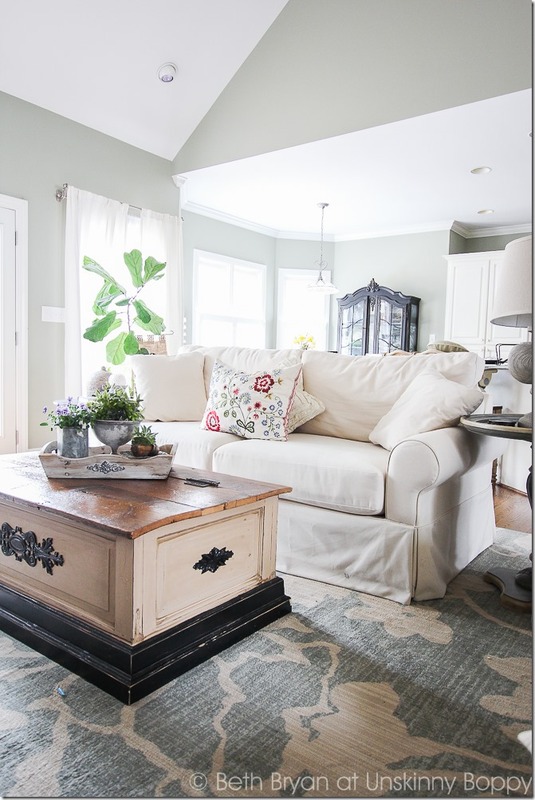 This is the Beacon Hill sofa from La-Z-boy in the “Topsider” fabric, and it is sooooooooo comfy. 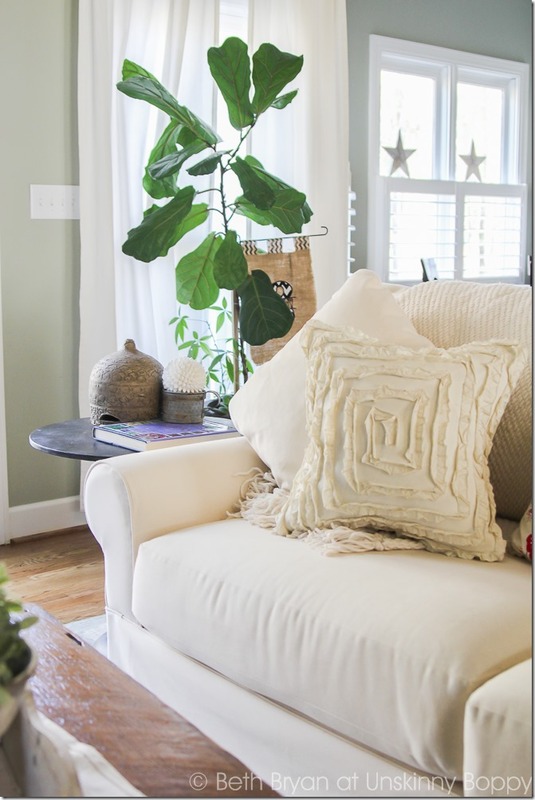 Everyday I sink into it and think “Ahhhhhhhhh”… It’s huge and squishy and perfect for my laid-back kinda style. My previous couch was a La-Z-Boy sofa that I purchased back when I was single for my bachelorette pad. In fact, it was my very first major purchase that I made for my first home. I wallered all over that couch for over 13 years, and it was still in good shape when I sold it to be replaced by this one. My friends all thought I was kinda nutty for getting a white sofa with kids and pets, but so far it’s holding up great. I’ve always heard that white is better because you can take off the cover, toss it into the wash and bleach it. I’ll let you know what I think about it in another year or so. I scored this Encyclopedia of Herbs coffee table book on eBay for just a few dollars, and I’ve been pouring over it lately as I plan my herb gardens this year. 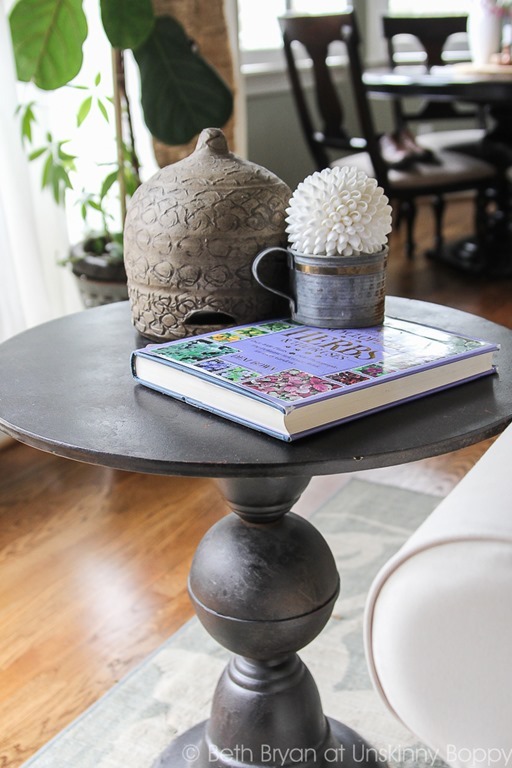 Over the past few years, herbs and herbalism have become a passion of mine (Thanks, Outlander and essential oils…) so this huge herb book was a major score! 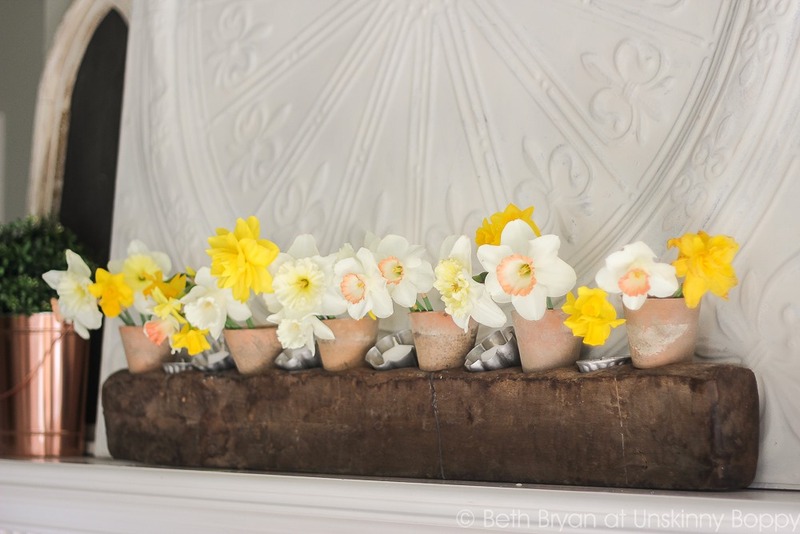 Over on the mantel I added a bunch of the daffodils that I picked from the yard inside my vintage sugar mold. I added vintage Jello molds inside a few of the openings with tea lights to make candle holders. 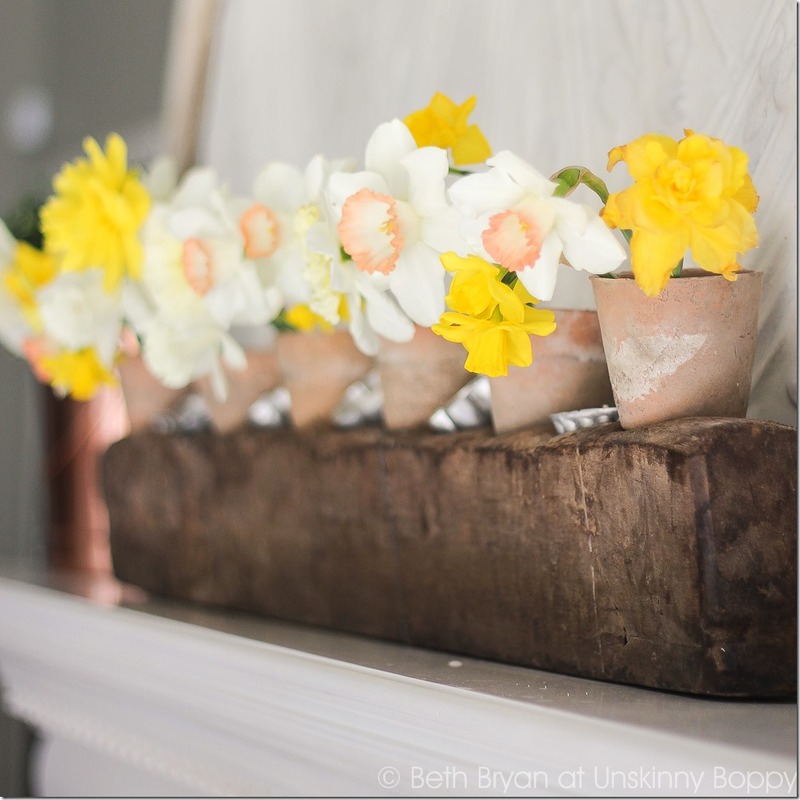 So, daffodils and vintage Jello molds inside a vintage sugar mold. What’s not to love? It’s a win/win/win for me. I have left the big tin tile up there since Christmas because I’m digging it so much on my mantel. It makes an impact and helps to break up the tall mantel that runs all the way up to the vaulted ceiling. This was definitely a K.I.S.S. 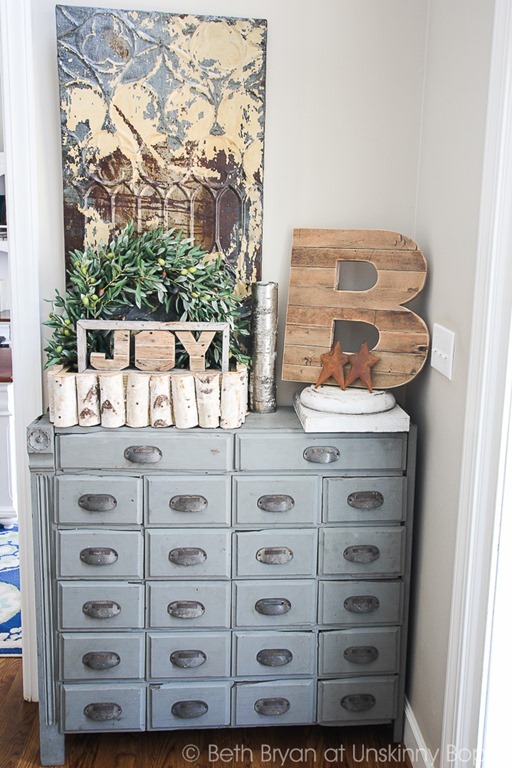 decorating move right here, but I’m digging the simplicity of it. I brought in my butterfly flower holder from the yard and filled it with a pot of ivy for some greenery on the hearth. The base of it is one of those Light-n-Go birch log bonfire starters that my local Publix has stacked up by the front door each winter. 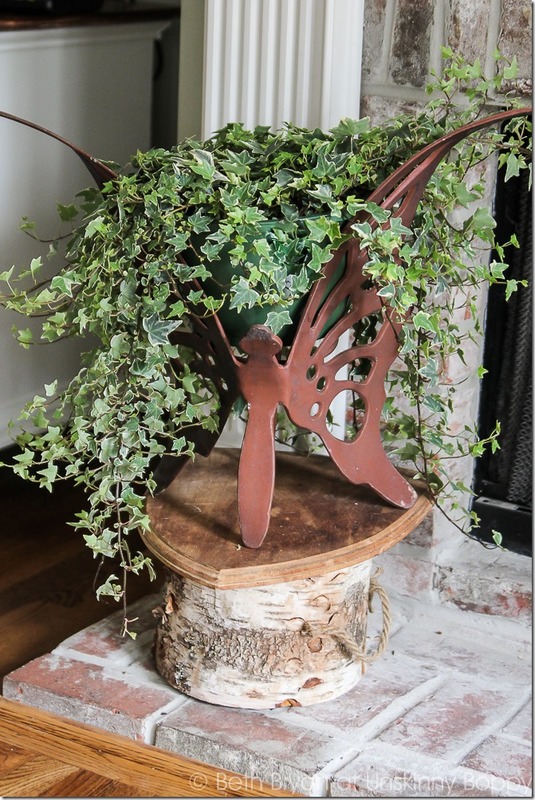 It’s too pretty to burn, so I made a little plant stand out of it. 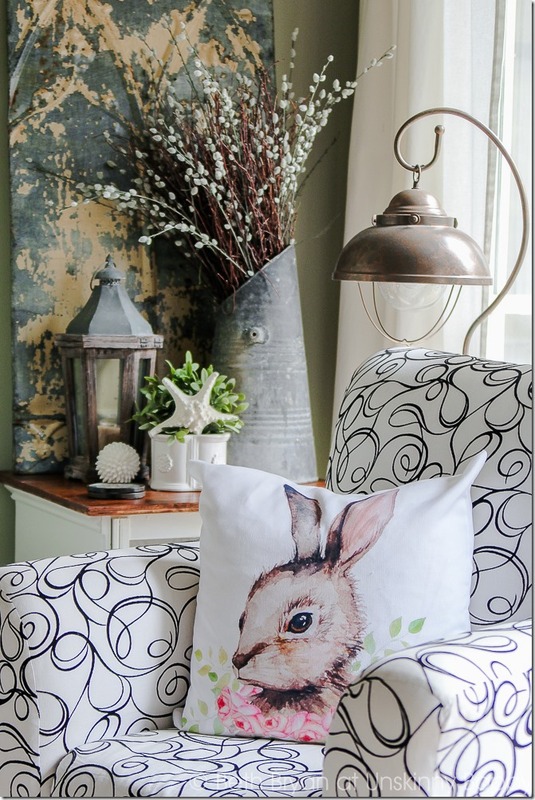 Over in the corner I added this SWEET little bunny pillow just in time for Easter- another Craftberry Bush original. Like I said before- I just love Lucy’s artwork on my pillows! On the coffee table I made this arrangement of flowers-a mixture of real and fake- for a centerpiece. 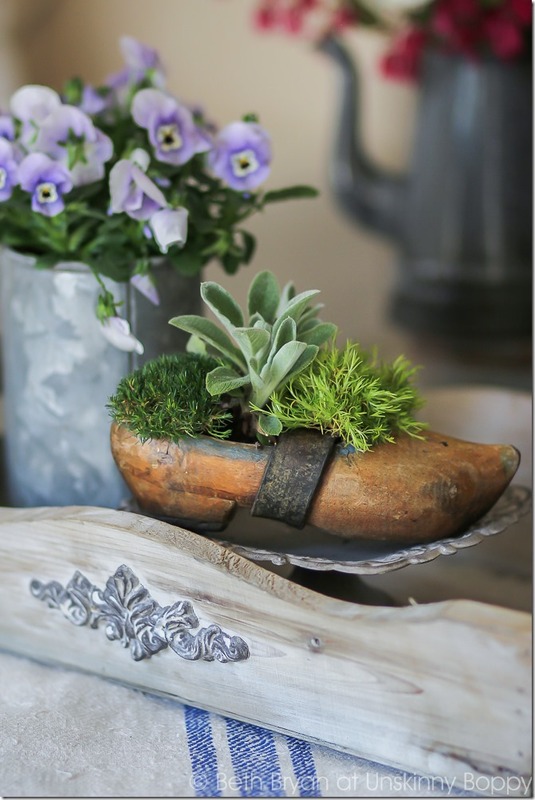 I found the old wooden shoe at a local thrift shop for dirt cheap, so I brought it home and planted little sprigs of moss and a piece of lamb’s ear inside. I can think of nothing that says “Spring!” more than a wooden shoe. Nobody in the world knows how to do spring flower bulbs better than the Dutch, so here’s my little nod to them in my Spring décor. 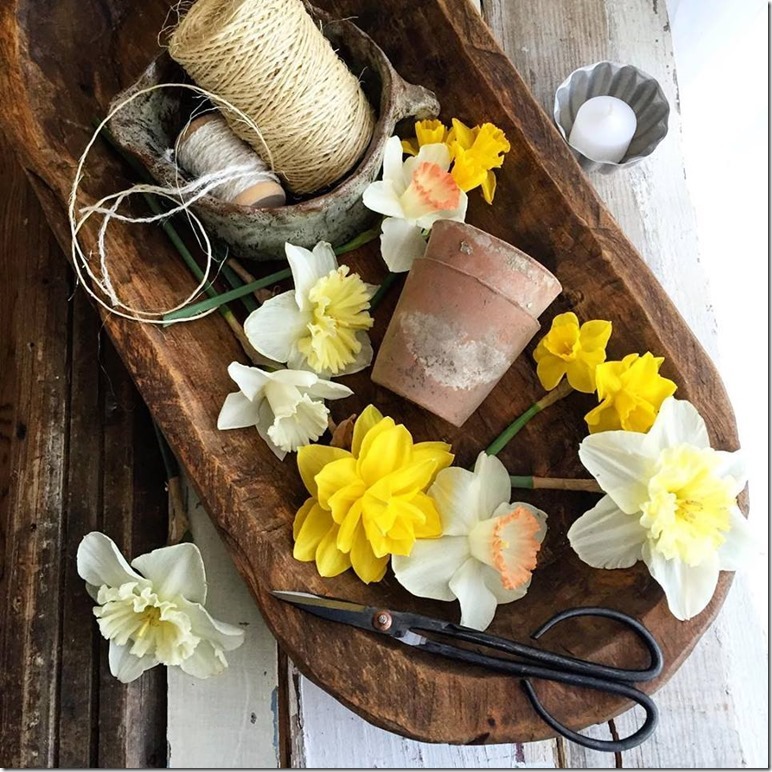 Into the kitchen now for even more daffodils on the table. I’m telling y’all they have taken over my house! It’s amazing. 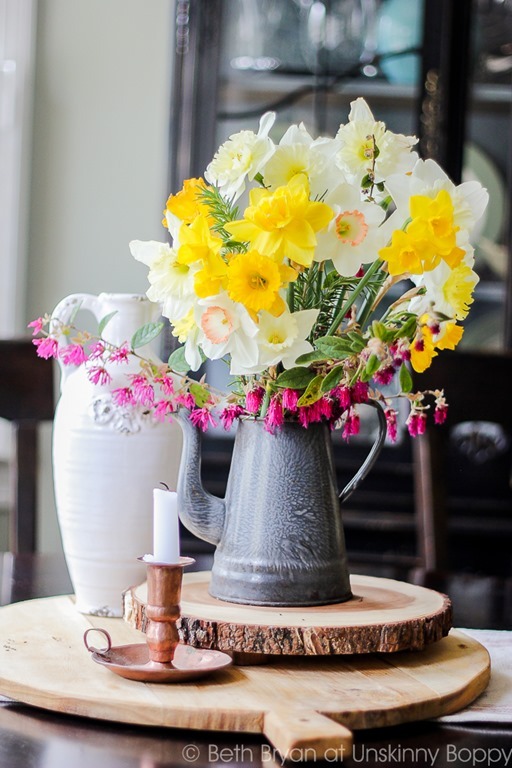 I added a few blooming sprigs of hot pink Loropetalum and rosemary along with a big bouquet of my daffodils to this enamelware teapot. 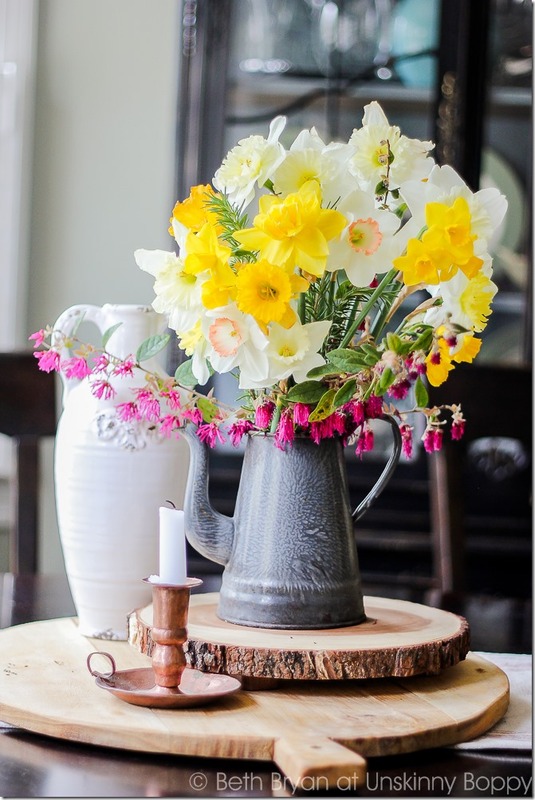 How’s this for a happy Spring table centerpiece? So, I decided I WOULD have something similar in my garden this year! Last year I accidentally planted one of my David Austin climbing rose in the middle of my flower bed with nowhere for it to climb. Whoops! 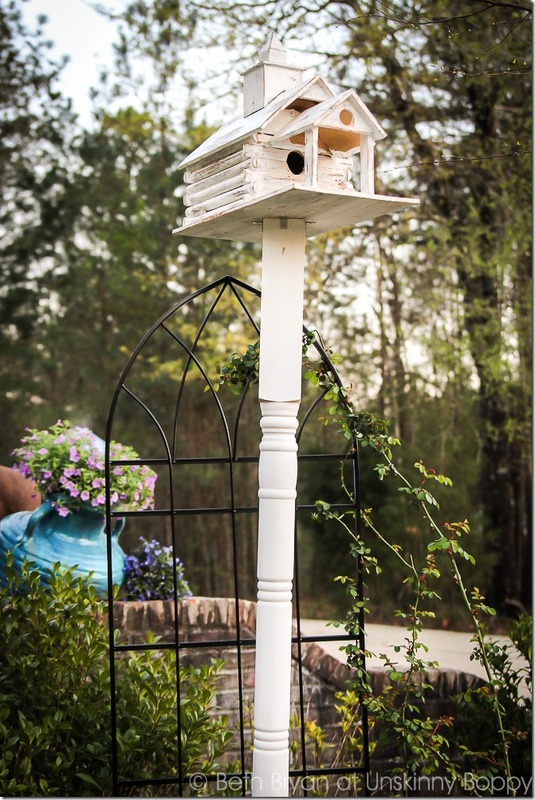 When I found this rustic log cabin church birdhouse at Cedar Creek Nursery, I knew that I had just the spot for it. I set out to recreate that pretty picture from above. Ok, so here is a closeup of the L-brackets and the E-Z Spike mounted in the ground. For real. This spike thingy is AWESOME! 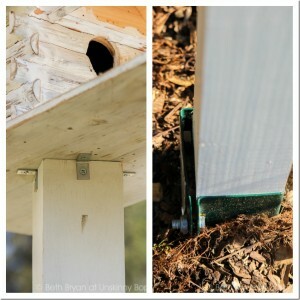 You just drive it in the ground and it allows a 4×4 post—like a mailbox or fence post—to be mounted easily in the ground without digging post holes or setting in concrete. Just shim it up a bit and tighten the bolts and you’re done. Like I said- awesome. 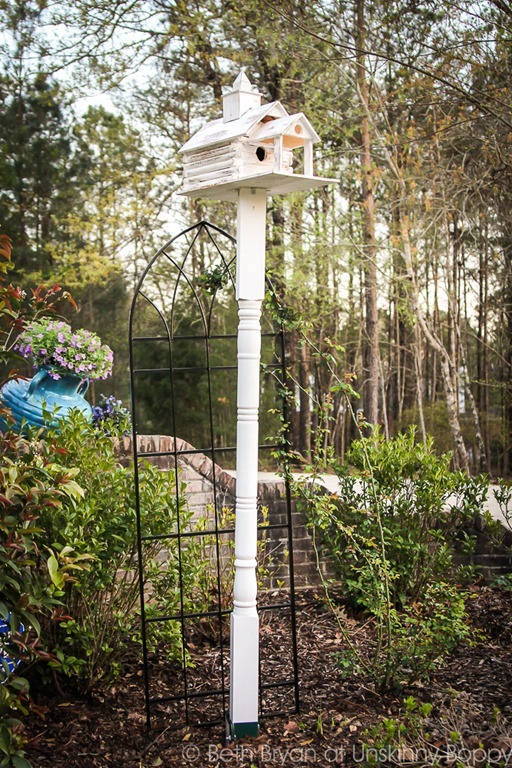 This was about a 20 minute DIY project with my husband’s help that has added SO much whimsy to the garden. 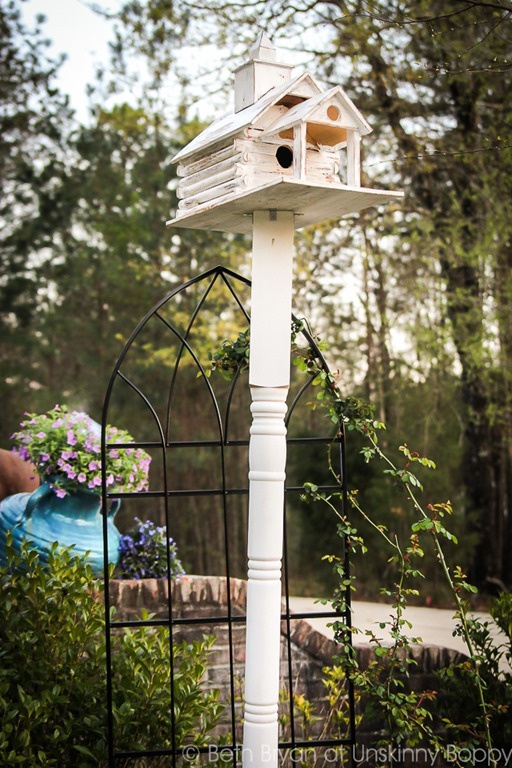 Hopefully a happy family of birdies will take up residence here eventually. I am training the rose bushes to climb up this Gothic arched garden trellis while they are growing. 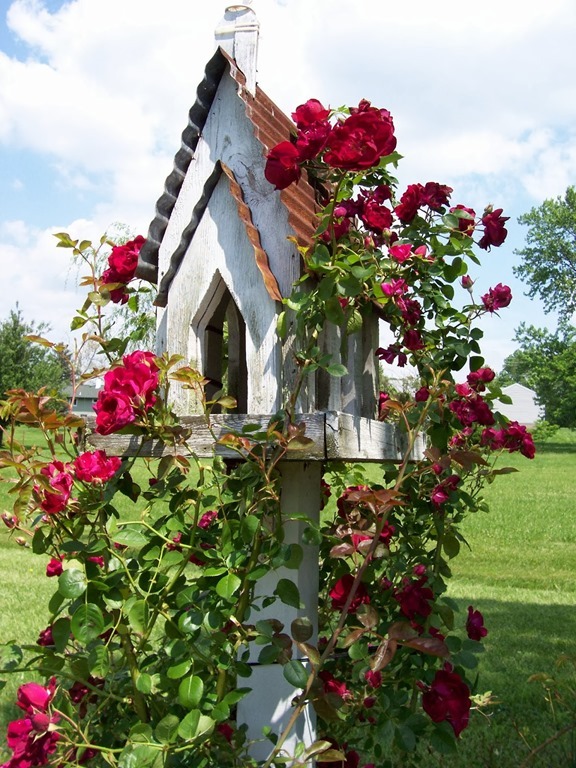 I hope by middle of Summer I’ll have some pretty peach/ orange Lady of Shalott David Austin blooms to share with you guys on my new birdhouse! That wraps up my Spring Home tour! Thanks so much for stopping by. 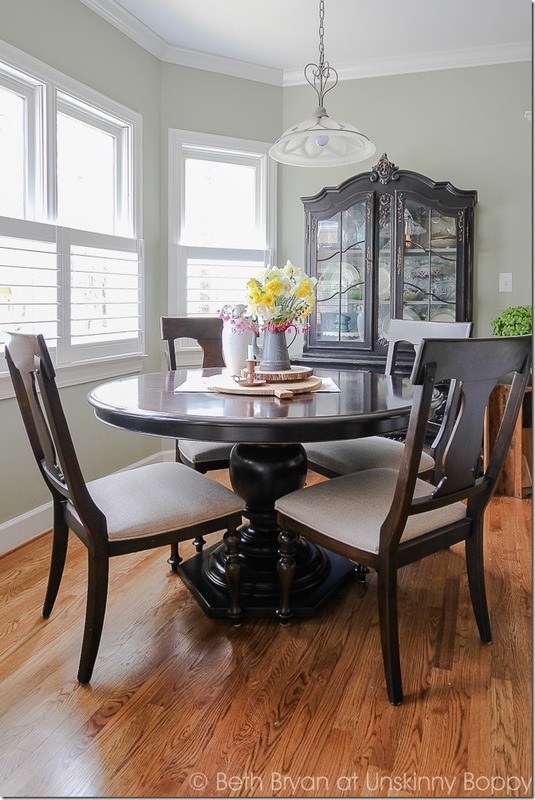 I hope you will go see all of my beautiful blog buddies homes who are also on the tour today. Each of them have super stunner houses and are giving you a fun DIY project to boot! 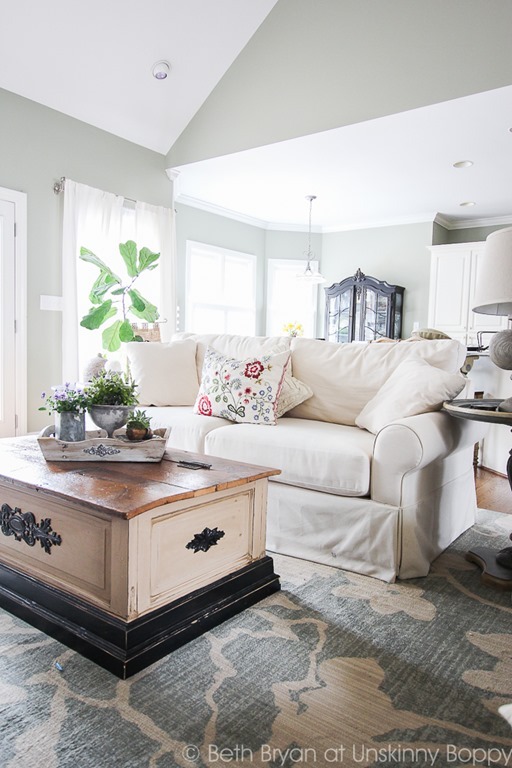 Disclaimer: La-Z-Boy gave me the beautiful Beacon Hill sofa that is featured in this post. The daffodil bulbs were provided by Colorblends Wholesale Flower Bulbs and the climbing rose bush came from David Austin Roses. I was not paid to endorse any of these free products. All opinions are my own. This post contains affiliate links. Ahh! 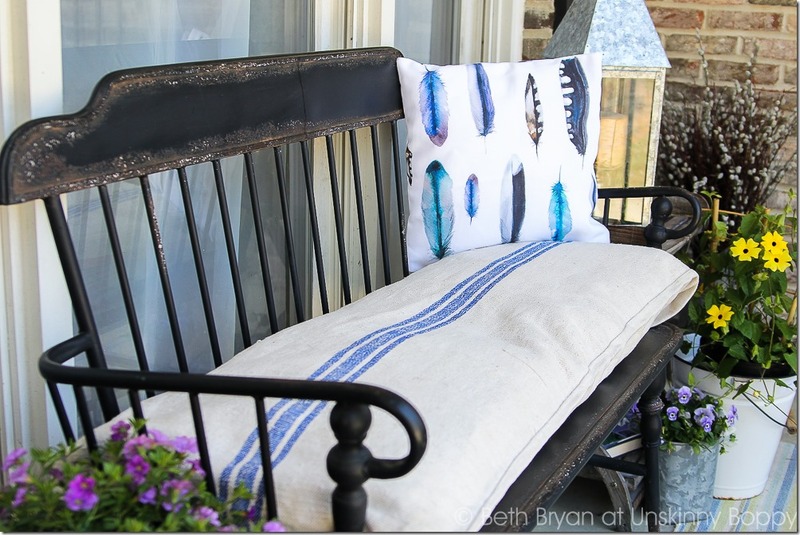 That porch bench and feather pillow are everything! Love it! Beautiful tour, Beth. I agree! SO glad I found it! Thanks Lauren. Awww that makes me feel so good to hear you say that! Thank you SO much, Stacey! What a beautiful tour of your home, The flowers are amazing and your ideas are magical! Thank you for sharing your tour and can’t wait for the next one! Happy gardening! 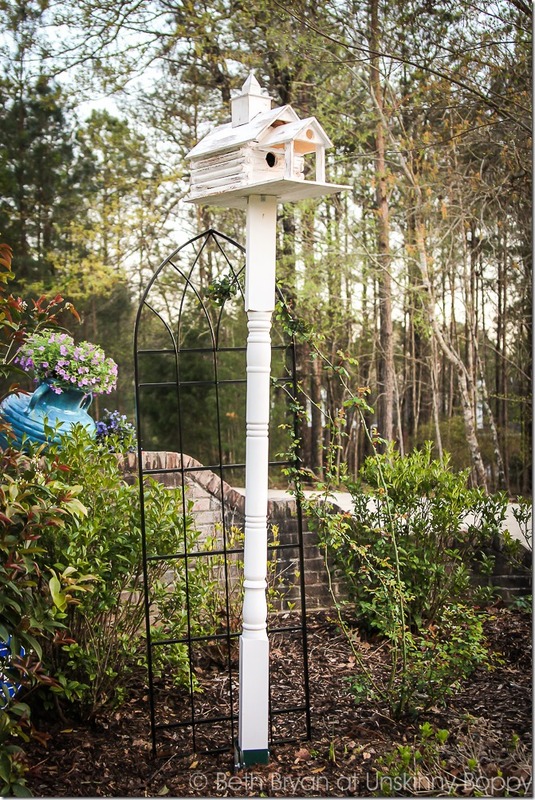 Oh I’m excited to see that birdhouse when the vines crawl up it and bloom! 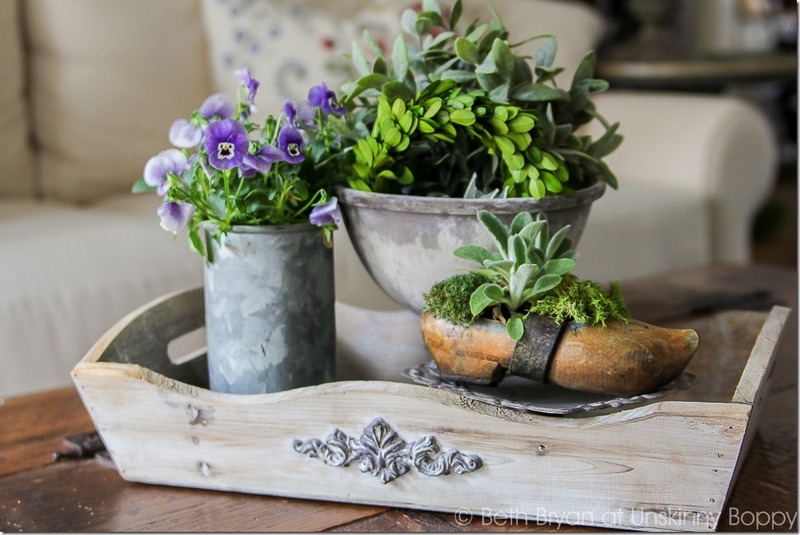 LOVE your DIY of that! I had no idea it could be so simple… Now I’m looking around at where I can put one of those! Beth you should not have put your Hallelujah Home Tour link at the top because I clicked over and got lost in all your pictures. 😉 Love your home so much. The daffodils everywhere look so happy and I love how you have so many interesting pieces that tell a story– salvage or otherwise. Thanks for joining friend! 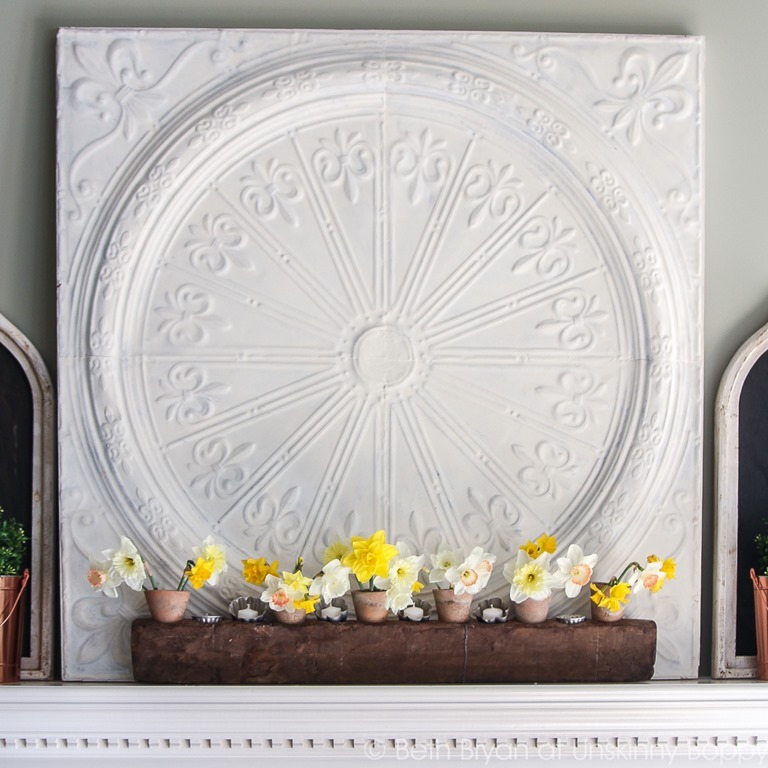 What a beautiful tour and those daffodils are amazing. Then to have them displayed throughout the house was so pretty. I really enjoyed getting to see your lovely home and can’t wait to visit again! Everything is so beautiful and those daffodils!!! So cheerful!! Love this beautiful home, especially the pillows, thanks for sharing with us the tour of your new home. Love the bench in your porch. Is it a piece that is available to be bought or was it a one time find? Thanks! LOVE, LOVE,LOVE YOUR ROOM. WHAT COLOR ARE THE WALLS IN THE LIVING ROOM? Beautiful spaces. Love it all thanks for sharing.